A pair of restaurants at the Exeter Racecourse exit, although only northbound is signed as a service area. The Happy Eater and BP forecourt in 1986. This site is also known as Kennford services or Haldon Hill services. The northbound side started as the Haldon Road House, positioned next to the Harker Lane turn. By 1975, the road house had been rebuilt and had become one of the original Welcome Break restaurants. 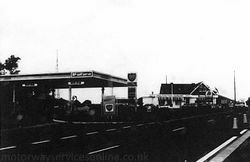 It had a tall, pointed roof, and was positioned alongside a BP petrol station. The rebuilding may have been connected to the A38 becoming a dual carriageway, which came very close to the old building. In 1978 the southbound restaurant was built next to a track leading to the restaurant - this may have been planned as a Welcome Break, but around the same time all of the Welcome Breaks (including the northbound one) became Happy Eaters. In 1986 the northbound restaurant was re-built to look similar to the southbound; it was painted white with a low roof. In 1995 both restaurants became Little Chefs. The northbound Little Chef had a conference room, and there were plans to build a Travelodge at the back of the car park. In 2007, the southbound Little Chef closed and became the Haldon Forest Diner. The signs calling it a service station were removed, in fact a sign immediately before the exit tells traffic there is a lay-by to use further ahead. The restaurant shares its exit with a small lane and an emergency access to the racecourse. 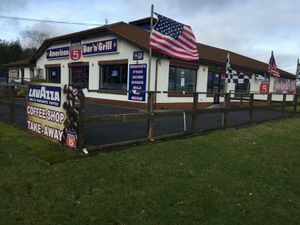 The northbound Little Chef closed in 2012 and two years later became the Route 5 diner. This is the only one in the chain not numbered after the road which serves it, as they already have a Route 38. Although there is a direct access and exit from the A38, there is also an entry and exit to the local road network. A new Esso forecourt and sales shop replaced the previous, smaller, BP forecourt. The site is due to gain two new drive thrus soon. The filling station was formerly operated by Chartman Retail then MRH; it is now operated by MFG.